Clarapy: Clarity + therapy. During a phone conversation with my friend Darcy one day, one in which I was extremely stressed out, I tried to thank her for giving me clarity and free therapy. In a fortuitous slip of the tongue, I uttered “clarapy.” Since I have invented a new word, I guess I have to define it now that it is part of my daily lexicon. As Ray Charles, Humble Pie, and others have attested to in song, “I don’t need no doctor.” They insist they need their “baby,” but what I think they really needed was some clarapy. Clarity: Lucidity. Understanding. Therapy: Treatment for some sort of disorder whether physical or mental. When I can’t figure out things for myself, I reach out to my friends. True friends. The kind of friends that put up with my crazy. In my case, they understand that there is a 100% chance I will swear, and they still answer my phone calls. I know, in turn, my friends will almost certainly need some clarapy from me during stressful events in their lives. I will listen for as long as they need to talk. Since a falling out with one of my closest friends almost three years ago, I have been examining friendship relationships more than ever. I learned a lot from books about friendship and my own fractured friendship. True friendship involves a willingness to put up with each other’s junk. The crazy stuff. The “I-can’t-believe-you-did-that” moments. And, in turn, I must put up with their crazy. Clarapy is part of the deal. In late January, my husband and I went to Florida. His mother was having some health issues, but under our care, she seemed to be improving. We went ahead with our previously made plans. I had agreed to power walk the Melbourne Music Half Marathon with my friend Pat. Despite the fact that I had zero training for a half-marathon, unless you count endless workouts on my elliptical trainer in Michigan, I agreed to give it a try. After all, I had run four half marathons in the past, so I figured I could pull off power walking one without any problem. After all, I had nine days in Florida to train before the race. Around mile ten on race day, after Pat and I had maintained an under 14 minute-per-mile-pace for the entire race, I realized I had blisters the size of silver dollars on the bottoms of both feet. I also discovered that I had forgotten to put anti-chafing balm on my right arm. Where my arm had rubbed against my tank top, I had a blister/bruise the size of Lake Okeechobee. At mile twelve, Pat and I clocked a 13:29 mile. At the end of the race, I showed Pat my blisters and bruises while I gulped down pizza and beer. She asked why I had never complained during the race. I wondered about that for days and days afterwards while I nursed my sore body back to health. When my mother-in-law’s health suddenly took a dramatic turn and ended up in the hospital, I thought about this more and more. After a particularly stressful day, I sat outside in the warm Florida sunshine as the sun began to set. A woman across the street rode her three-wheeled bicycle, circling a parking lot. Around and around she went as a small terrier rode in a white basket on the front of her bicycle. For some reason, I felt insanely jealous of this woman. I wanted her bicycle and her dog. What was wrong with me? Logically, I knew I wanted my mother-in-law to heal quickly. I wanted to ease my husband’s pain and stress. After watching me cope with my mother’s Alzheimer’s and my father’s dementia and cancer, a period of about six very stressful years, my husband understood all too clearly the crazy that comes with caring for an elderly parent. It can be the loneliest feeling in the world. I needed to be strong for him. How could I provide clarapy for my husband when all I wanted was to steal a woman’s bicycle and her dog? Typically, a good run or a power walk works sufficiently for waking up those feel-good endorphins and prevents me from committing a crime. Despite the fact that the hot weather in Florida was the extreme opposite of Michigan’s frozen-lakes-in-winter syndrome with temperatures and wind chills in the negative thirties, I was miserable, but I wasn’t sure what would untangle the threads of craziness circling through my amygdala. I gave a little spin on Pure Prairie League’s song “Amie,” and sang, “Amy G, what you wanna do?” The answer seemed obvious: clarapy. I sent out a few text messages, and that’s when my friends began to offer up their own special brands of medicine. Phone calls. Emails. Cards. Friends driving across the state of Florida to hang out with us and search for manatees. Eventually, my mother-in-law was in a rehab facility, and we were invited up the coast to stay with friends for several days. We were still just a short car ride away from my mother-in-law. In addition, I had long phone conversations with several Michigan friends where I ranted and raved about all sorts of things, and my friends did not hang up. Instead, my friends provided insights from their own similar situations, words of wisdom, or simply found ways to make me laugh. My friends might not wear capes or have x-ray vision, but they certainly have the power to heal what’s ailing me when exercise isn’t enough. How was I able to finish the half-marathon when my body hurt so much? I could have stopped, slowed down, or started whining (or swearing which would be much more likely), but I did not want to let Pat down, nor did I want to let myself down. I knew I could do it. “Mind over matter” as my mother used to say. I knew my body would heal later. Why is dealing with a sick parent or child much more difficult? Why do emotions overtake our heart strings and play us like an out-of-tune harpsichord? When my mother-in-law was in the hospital, a woman in the next room kept loudly moaning that she was sorry. She didn’t mean to be bad. She wanted help. I began reliving my mother’s Alzheimer’s disease and had to spend time in the chapel just to get my game face on for my husband and mother-in-law. I began to rely more and more on my friends’ gifts of clarapy. And it is true. Friends are gifts to us. Over the past few years, I have been lucky enough to spend more time with my friends and my cousins. I have learned so much from them every moment we have been together. Many of them have seen me at my absolute worst: the death of my daughter, my mother’s illness, my brain tumor, the death of my dog, and the last few horrible months of my father’s life. These are the things that define me and have made me temporarily crazy. After each sadness and heartbreak, the fogginess in my brain would begin to lift as my friends and cousins gave the gift of clarapy in their own ways. Those moments are stored in my memory so that I can pull them up at a moment’s notice as if I am opening the pages of an old picture book: Running in the Flint Hills with my cousin Sybil as an eagle soared overhead. After the death of my daughter, receiving almost daily phone calls or visits from my friend Vicki who listened to me talk. Or not. Hugging my friend Darcy at the end of my first road race after Gamma Knife surgery for my brain tumor. Receiving feedback on my writing from my friend Chris as I struggled with language and writing after the effects of radiation and medication. Watching manatees floating in warm waters with my husband and friends Peggy and John in Florida as we worried about my mother-in-law. 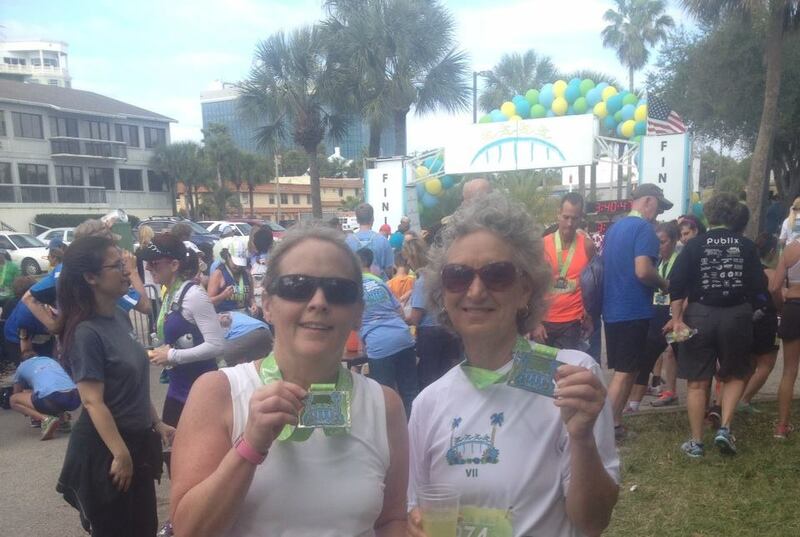 Intentionally crossing the finish line in step with Pat at the end of a half marathon. The list goes on and on. I am back in Michigan now running on the roads I find such comfort in. My mother-in-law continues to heal in our home. I try to make my husband laugh as often as possible. I have been working on my clarapy game with him and my friends. I will do everything in my power to give them what they need. It might be as simple as listening or running a race together. Perhaps sitting on a beach somewhere and watching the world go by in silence might be the order of the day. Or perhaps it will be in a way I have not yet imagined. I am ready. My blisters and bruises have healed for now. My heart strings are in tune. I am still thinking about the dog and the bicycle. In early September, I joined four women at Chicago O’Hare International Airport as we all flew in from our hometowns. LouAnn Law, Amy Hall, Audrey Lewis, and Julie Bowline had devised a plan for us to meet and surprise Sybil Benson for her 50th birthday. These women are sisters and the daughters of my late mother’s brother. My cousins wanted me to be part of the Great Reveal. Bryan Benson, Sybil’s husband, had been part of the plan from the beginning, and he picked us up at the airport. The ride from the airport to Libertyville where Bryan and Sybil live passed quickly. We were eager to change our clothes at their house and prepare for surprising Sybil. Bryan drove us to Mickey Finn’s in downtown Libertyville. As we walked into the bar, we turned quite a few heads. We weren’t sure if it was our good looks or because we were very loud. It could have been because we were all dressed in black, wore buttons with Sybil’s pictures at various ages, and draped mourning veils over our heads. 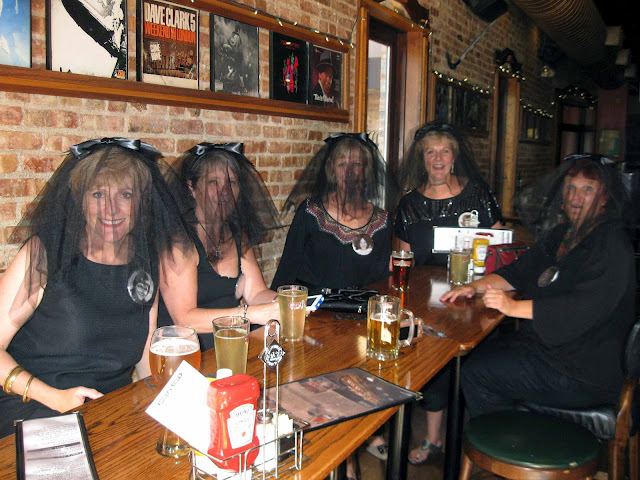 If I had realized wearing a mourning veil into a bar was such an attention-getter, I may have tried it when I was young and single. We engaged other people at the bar and told our story. Not only were we anxiously anticipating Sybil’s arrival, but so were the people in the bar. When Sybil headed in from the rear area of the bar, the bartender raised her hand in a silent signal. As Sybil began walking towards us, she looked confused as she stared at her husband sitting at a table with “five orbs,” as she would refer to us later. 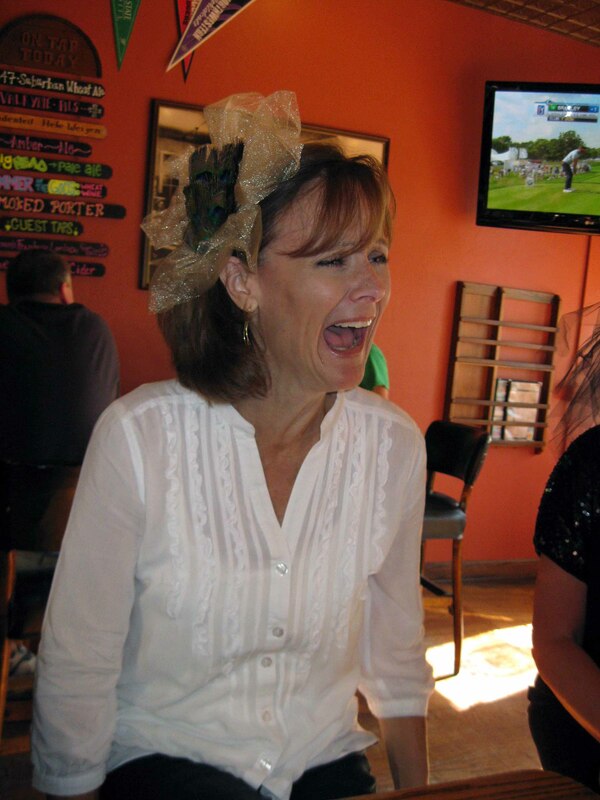 When we burst into song, everyone in the bar joined in as we sang “Happy Birthday” to her. After explaining to Sybil all of the preparations that took place to pull off this caper, we settled in to share stories. As one of the bar patrons, a man around fifty-years young, exited the bar, he stopped by our table and spoke directly to Sybil: “Hello, I am English John. The good news is that I am not the stripper.” If English John ever mentioned what the bad news was, we were laughing too hard to hear him. Stories…we had so many stories to share. With the recent death of my father, sharing laughter, love, and stories was just what I needed. I felt as if I had been transported out of grief and into a space of jubilation. Later, we returned to Sybil and Bryan’s house and settled in. We used Skype to connect with other family members until late in the evening. We talked about my parents, their father, and the loss of our mothers. Before my father died, he knew I was going to Libertyville for the Great Reveal, and I know he was very happy for me. On Friday, Bryan went to work, and the six of us hit the road. We started our day at a fabulous restaurant in Libertyville before heading off to Oak Park. We toured the Frank Lloyd Wright Historic District and his Oak Park home and studio. I was fascinated with our journey, and as we walked past the houses, and later throughout his studio and home, I kept thinking what a lucky person I was to have such amazing women in my life. Months earlier, my cousins had decided that I should be the sixth sister, and they introduced me as such everywhere we went. This act of love and kindness created a strange sensation in me. As someone who had grown up as an only child, I imagined how my life would have been different had I been surrounded by sisters. When I was very young, children in school made fun of me for being adopted, and I would go home crying. Although my parents tried to comfort me, the string of words I heard on a regular basis stung. When I was older, I wondered where these children learned this behavior. What were their parents telling them about what it meant to be adopted? Although some of the children I went to school with from kindergarten until 8th grade never let up on the fact that I was supposedly different, most of them gave up their bullying routine as we grew older. Some became close friends. My cousins, however, always treated me as if there was nothing different about me: I was just Bob and Margaret Lyn’s daughter. In the essay “Modern Friendships,” Phillip Lopate suggests that the “Friendship Scene” is “a flow of shared confidences, recognitions, humor, advice, speculation, even wisdom.” Here was a group of women who had known me long before I knew myself, and they had loved my parents deeply. Since it had been less than two weeks since my father had died, I felt myself climbing into a box of memories of him, always knowing how much he cared for others, and how much he valued his family and friends. After so much loss in my recent past, I finally felt as if something was opening up for me with this group of women; something I had not planned on, and nothing I could have expected. On Saturday, we walked around Independence Grove, a beautiful area near Libertyville. We eventually worked our way to downtown Libertyville and an art fair in Mundelein. We were just killing time until the main event. Yes, the “Great Reveal” had been an event to remember, but we had also planned to incorporate the past into our weekend. When we were young, our grandparents went on a cruise for their wedding anniversary. I am guessing that my mother and my aunt had gotten together and decided we should all dress up and put on a little show for our grandparents bon voyage party. Since Sybil wasn’t born when the original picture had been taken, we had decided to recreate the moment of our Hawaiian luau from so many years past, so that we could include Sybil in the picture. As we dressed up in hula skirts, small silky tops, pearl ankle bracelets, and leis, and put flowers in our hair, we laughed until we cried before heading to the basement. We posed for pictures, and Bryan snapped photos from dozens of angles. Unfortunately, I am not allowed to share those photos with anyone outside our families. My cousins/sisters were adamant that the photos stay within the family. Apparently they believe little girls in grass skirts and crepe-paper bras are much cuter than grown women wearing grass skirts, spandex, and silky material wrapped around our cleavage. Although I am willing to share photos on Facebook or with anyone I can find, I will stick to my promise. Well, unless someone offers me a great amount of money. I realize now that friendship and family are sometimes two very different things, but we shouldn’t always be so eager to categorize. Throughout my life, I was always labeled the adopted child or the only child. Is everyone supposed to fit into one category or another? I have friends who are like family to me, although no familial ties bind us. With my mother and father now both deceased, I seek stories, advice, and wisdom from my friends and family. The people in my life who blur the lines between friendship and family are the ones I can count on, the ones I will always make time for, and the ones I would do anything for. I have learned many life lessons since I found out I have a brain tumor, and I thought of a lesson I had learned when my daughter, Nicole, died in 1988. There are people who walk away from us just when we need them the most. They retreat from us slowly, or sometimes in a moment of anger accusing us and judging us for things we say or do when we are knee deep in sorrow and despair. And one morning you step away from your sadness and start focusing on people in your life who embrace you and listen to you as you try to negotiate through your pain. They surround you with love, listen to you as you tell your stories of unconscionable grief, hold your hand when you weep from sadness, and laugh when you find something you can once again joke about. The Great Reveal reminded me of all of this, and now my work is cut out for me. I want to be that person who listens to my friends and family when something causes them pain. I want to be someone a person can count on during a period of grief or sadness. Most importantly, I will be present, and I will listen.